One of my favorite things about Tacoma is that we have so many interesting events. Our ArtWalks are legendary. Last week I participated in Tacoma’s first lit crawl. And next weekend on Saturday October 24th Tacoma will have the Gothic Witches Ball. 1. What is the Gothic Witches Ball? The Witches Ball is an annual event (this year’s theme being Gothic). In the past it has been hosted by Tacoma Earth Religions Revival Association (TERRA), and later hosted by Central Puget Sound Pagan Pride. This year it is being hosted by Magical Garden. It is a night of ritual, dance and magic. 2. What’s different about the Gothic Witches Ball this year? It is a smaller venue, more intimate. The theme is something that I am unsure has been done before. In the past the Witches Ball has been hosted by Tacoma Earth Religions Revival Association (TERRA) & when they disband a couple of years ago, Central Puget Sound Pagan Pride had taken it over. I wanted to keep the tradition of the Witches Ball alive and decided to host it this year. 3.What are possible misconceptions people might have about the Witches Ball? That you have to be a witch to attend. We welcome everyone. 4. How can people attend and how can they help if they want to? Get your tickets at Magical Garden. Our address is 430 E 25TH Suite #9 Tacoma, WA. You can call us during business hours (Mon-Sat 11-7) at (425)591-7345 or order online at: Witches Ball ticket. I should mention tickets are limited, and are going fast. 5. What do you see for the future of the Gothic Witches Ball? I envision the tradition of the Witches Ball coming back stronger and better than ever. Thanks to Angela for taking the time to join me for 5 Question Friday. If you think you or anyone you know would like to participate in a 5 Question Friday, email me at jackcameron.com. 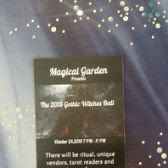 This entry was posted in 5 Question Fridays, Tacoma stuff and tagged 5 Question Friday, Angela Kores, Central Puget Sound Pagan Pride, Gothic WItches Ball, Magical Garden, Magical Garden Tacoma, Tacoma Earth Religious Revival Association, TERRA, Witches Ball. Bookmark the permalink.